Looks really good, but for now we know that there is an editor perfect to make DOTA2 stuff, and I don't really care. ​Will it work with a steering wheel? This was the exact video I was think of when I commented. The terrible UI is the same of CSGO if we are talking menus, by looking at screens on website… or was always like this? i dunno, never liked this UI since they put it in CS. Haven't played much but I don't like it. CS:GO's menu is like Dota's old menu done by someone who never played Dota. It was so much less responsive and messy. Dota's was fine, and the new one is actually really good. It throws the stuff you want to the forefront. I have to say, I welcomed Valve embracing Webkit and building a lot off of it, but in general doesn't seem to work too well (Steam client is slow, inconsistencies/limitations that get in the way compared to web version etc). Wonder if lack of responsiveness comes from that as well. CS:GO's (and old Dota's) ui is done with Scaleform, which is garbage from the start, honestly. Valve's new framework, Panorama, seems to be pretty good. Big Picture mode was also never too bad and is based off of Panorama as well. Steam's chromium/webkit stuff is totally awful though, hopefully they refresh the desktop client soon. Ah, interesting thanks, didn't read about Big Picture (but wasn't thinking is WebKit, was referring to steam client and overlays for the community). i like Big Picture, but found it a bit laggy even on my new computer; I'm sure can be improved a bit more for navigation, although I think standard desktop is the worst atm. I have a vive at work and I thought it would be interesting to see the map i'm working on in virtual reality. I couldn't get VR to work in HL2 or TF2. It could be because I only have 4gig ram at work. It could also be the lack of support from valve. 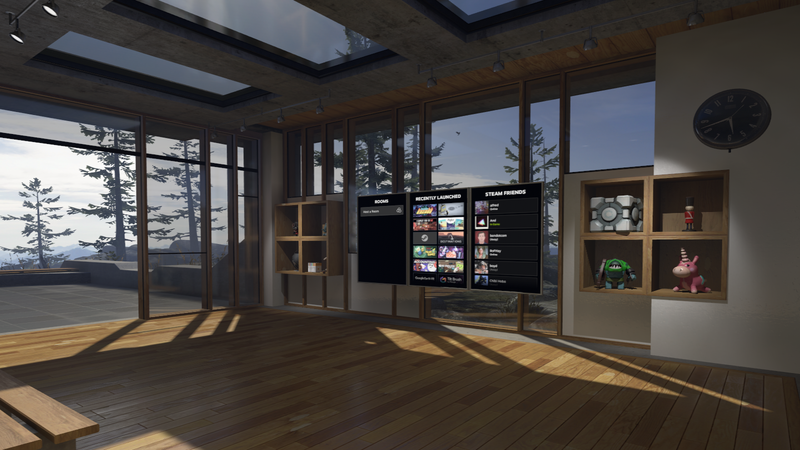 Anyway, SteamVR has also home environments, it's like your "home" from where you can launch games. Chat with friends etc. Those home environments run on the source2 engine. So I thought let's port my map to that. Well opening the map in source2 hammer is easy but all your textures are lost. Also things like func_detail are gone. They show up but it's not an entity anymore. This is because maps for source 2 are more like models. Hence the editor has now edge loops, splitting, bevel and stuff like that. Which I think is really great. Also the editor is way faster. I always found hammer to be really sloooow. Even on a quite small map, dragging stuff around never felt smooth. Now it runs close to 90fps and when I drag stuff around it goes to 60. I have to say my map is quite small but still it's so much smoother. And I have to say, this is with a really nice lightning preview! Also, you don't have to make a skybox around your map, so having leaks is also gone. For me it's not that big of a deal but it's sure something I embrace. The icons in the editor are quite horrible. They are really grey-ish and therefor they look all quite similar. This seems to be a trend in icon design in general which I really dislike. They eye works so well in perceiving color. Here 2 images for comparison (and note that hammer2 has a lot more icons, I only show the side bar here). Note that in certain parts they do have icons with really good distinguish colors! You can also map really well from only using the 3d viewport. This is really nice. I only go to a side view to place a model precisely on the floor for example. And the lightning in the viewport is really nice, including shadows. With the hold hammer I really disliked the contrast, I always hoped they would add ambient occlusion or something. Anyway, my point was to see my map with VR. And this is really nice. It's only a small part I have with no textures but it's so nice to walk in your own map. To feel the scale. I made a car out of brushes for example based on the scale of the car you see in de_nuke. Now with VR I really felt how the car was to big. Which is nice cause i'm making a parking garage. And large areas don't do well in csgo, and now I have the cars like 0.9 times smaller I can make a lot of the map smaller too. Maybe I post more thoughts later. @clankill3r Yes please do ! Also, if you can take videos of both the map ingame and in editor, that would be awesome. I would love to see these lighting in editor and how you work on the modeling.